A Good Day to Die Hard seems to be a glorified commercial for Mercedes-Benz. First we got a /a-good-day-to-die-hard-the-vehicles-of-john-mcclane-featurette/featurette showcasing their vehicles as used in the film. Now, the first clip has arrived with quick snippets of classic John McClane dialogue interspersed with footage of the Mercedes-Benz Unimog wrecking havoc across Moscow. It plays like a first quarter Superbowl ad. 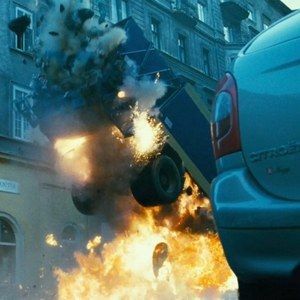 Watch as Bruce Willis returns to this classic action franchise by punching a Russian civilian in the face, running over the top of a woman's car on the highway, and causing plenty of vehicular smash 'em ups. It's a lot of branded fun. So far, A Good Day to Die Hard feels like the best straight-to-DVD action movie that the WWE never made. Which isn't such a bad thing. The Unimog is a multi-purpose auto four wheel drive medium truck produced by Mercedes-Benz. The name Unimog is an acronym for the German "UNIversal-MOtor-Gerät", Gerät being the German word for machine or device. Daimler Benz took over manufacture of the Unimog in 1951 and they are currently built in the Mercedes truck plant in Wörth am Rhein in Germany. Bruce Willis's John McClane uses this vehicle to get closer to the enemy, litterally putting it through the paces on a mean stretch of Russian highway.